Male Rompers - The new fad of 2017? You are here: Home » Style » Male Rompers – The new fad of 2017. Is it for the modern gentleman? Have you heard what the hot trend is for men- is it a new shoe, nope, a new hat, nope, a new cologne scent that everyone is wearing and driving the women wild, nope. It’s the Romphim or the Male romper. Do you know what it is? A romper is a young child’s or toddler’s one-piece outer garment or a one-piece outer garment for adults, typically worn like overalls it was popular for women in the 1950’s but fell out of style but it was always used a for little children. But the male romper is for adult men. The latest fuss about these all-in-one garments started earlier this year when a small team of entrepreneurs launched the RompHim, a male equivalent of the familiar women’s romper, on the crowdfunding website Kickstarter. 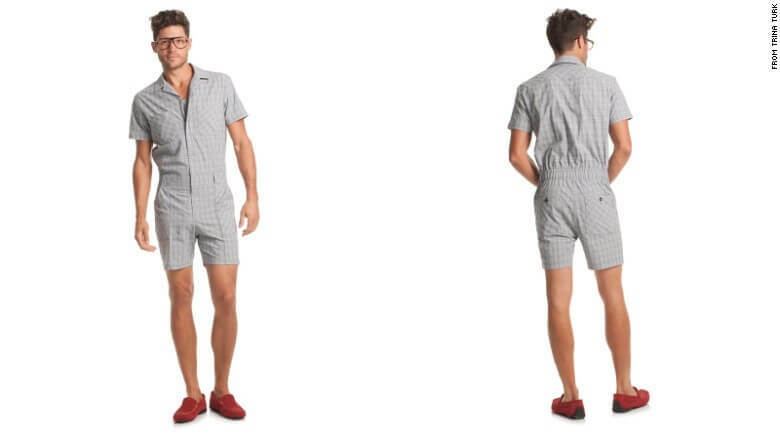 The RompHim set the Internet ablaze, causing people to debate and joke on social media, at work and elsewhere about the merits (and design faults) of rompers in general. And what started out as a desire for $10,000 in funding for the cheeky RompHim one-piece — it comes in polka-dot patterns and pastel hues — has now brought in more than $350,000 in seed money, with more expected. The question of the summer, how should we feel about male rompers? Should a gentleman wear a RompHim? More importantly, since summer is the time for LOVE, would a woman date a man that wears a romper? I have not met a lady personally that think this fad is attractive, but that’s just me. It’s easy to say why a gentleman should not wear this fad based on the looks only. Yes, this is an article of clothing that a toddler would wear and it is getting passed off as something that is o.k. for a man to wear. I could go on but in this article I will attempt to make the case to wear a male romper. Similar outfits have been around for a long time. 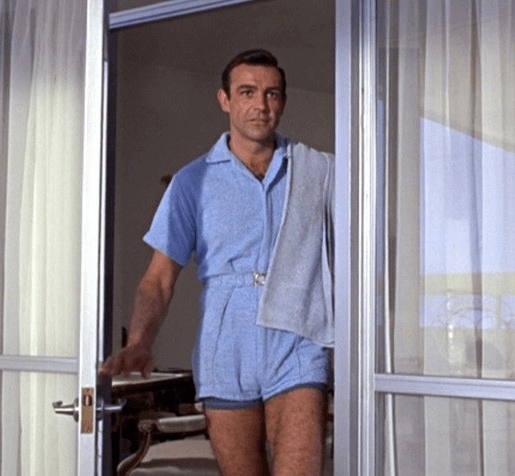 Even Sean Connery as James Bond in 1964’s “Goldfinger,” wore a thigh high blue terry one piece male romper. If it is good enough for 007 isn’t it good enough for us. Another reason to wear a romper is that especially if you work out. You can show off your legs and you can partly open up the top part to show off your hard work in the gym. Bottom line you have to have an abundance of self confidence, probably too much, to wear something that is usually made for toddler. Further if you do wear these you know for sure you will stand out. Also, there are many people who like to live outside of gender norms or are gender neutral. A male romper is perfect for them. If you are a person who likes to be risqué this is an outfit for you. Another thing that we can look at is how there are many things that were made for women at first but now is ok for men to have. Loofahs, lotion, shower gel, and even leggings (only wear these to the gym or while exercising please). So who’s to say that this fad will not follow the same route and become acceptable to most men. The biggest example of the change of thought of things that are masculine vs. feminine is in colors. There was a time in which a man who wore pink was ostracized. Now if a man is comfortable wearing pink or any other pastel color he is seen as self confidant and as a gentleman you should be comfortable wearing those colors. Remember that decades ago women wearing pants was taboo, needs to wake up and get with the times. They are relatively inexpensive. You can get an outfit for less than 40 dollars. Of course to get a higher end male romper it will cost more, but being able to have a summer outfit for less than 40 dollars that’s a great deal. If you like to dress like famous people there are plenty of famous people who where male rompers, from Television personality Andy Cohen, to American basketball player Lebron James are on the cutting edge of this fad. 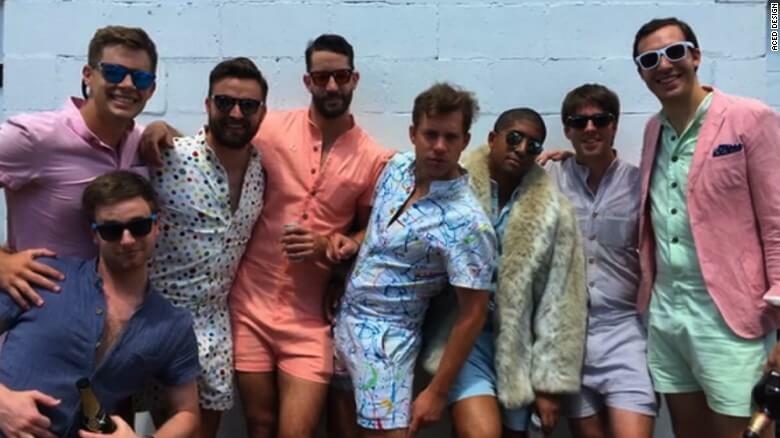 They can be seen wearing male rompers. It’s the Summer of the Romper—for anyone who wants it to be. I hope I laid out some points to think about, and maybe even got you to think that it may be ok for a gentleman to wear a male romper. Now we come full circle, should the modern gentleman wear male rompers? NO NO NO NO NO NO A THOUSANDS TIME NO!!!! In addition to the fact that no matter what this is still a toddler’s outfit. There is no place that a male romper fits in and looks nice. You can’t wear one to the office, wearing one to the beach goes against the purpose of the beach, to swim or tan. A male romper covers too much. It’s too casual for a formal night out, and trying to use the restroom for a casual night out is not a good idea. But most of all, one of the main rules of being a gentleman is not to get caught up in fads. Looking at the must have for every gentleman the black umbrella, the classic cuff links, the vests, tailored suits, boat shoes, correct cologne for the season, nice tailored khakis or jeans or shorts, proper masculine grooming etc..these things will never not be in style. These things will always look stylish. Will the male romper look good next year, or in ten years. No. 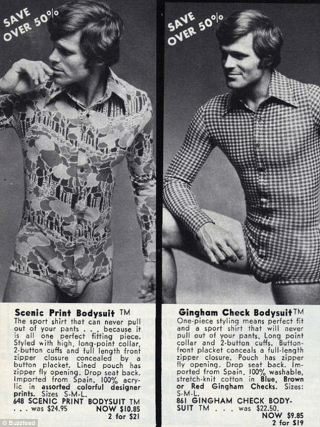 Don’t believe me, would you wear a leisure suit that was stylish in the 1970’s or what about the rompers for men that was in style then. (see below). As a gentleman you must be timeless. Take the money that you would spend for a fad and buy something that will still look great in 2018 2028 and 2038.